About the Children's Department: Put Feet to Their Faith and Involve Your Kids in a Project with the Seed Company! Put Feet to Their Faith and Involve Your Kids in a Project with the Seed Company! We have God's Word - and far too often take it for granted, but for many people around the world having a copy of God's Word in their own language is a dream. 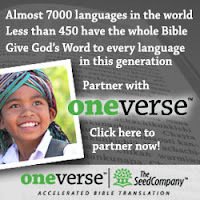 The Seed Company is involved in translating God's Word into languages of people around the world who do not have a copy in their own language . . . you can involve the children in your ministry in a project to help bring God's Word to people who do not have it! Consider Putting Feet to Your Kid's Faith by involving them in the following project . . .
That same year, in partnership with The Seed Company, eight mother-tongue translators began that project. Now they’re entering the final stage; praise God! Facing daily persecution, Huichol believers cannot think of a better time to receive more of God’s Word. He hears their cries, remembering the faithful remnant, who entrusted their hearts to Him in the 1940s—before they ever had His Word. This is a two-year initial phase for training and translating the Old Testament. The local Church sent a letter to SIL asking for help on the Old Testament, and now the project is progressing very well. In fact, as of 1-6-09, paperwork for the transition of Huichol to a full-scale project is in process. Despite opposition, this project has a good foundation and expectations of a significant impact are high. Nearly 80 percent of Huichol believers are now literate in their language. The New Testament was completed in 1967 and is used extensively in a very active church. There are over 30 Huichol churches throughout West Central Mexico, and there is strong community support of the project within the Huichol-speaking churches. The Huichol translators attended a training workshop to have their work checked with qualified help. Pray that the team will take full advantage of what they learned at this course. The team has been making headway as they prepare initial drafts of Old Testament books, such as Exodus, Numbers, 1 and 2 Samuel, 2 Kings and Jeremiah — all large books. They finished translating the short book of Joel. Thank the Lord for all that He has enabled them to accomplish. Pray that God will encourage the team when they feel overwhelmed at the immensity of the task — the Old Testament is over 23,000 verses long!